When I finished watching it, I didn’t want to see it again. It gradually descended into depressing finale, killing off every lovable character one by one. The survivor is the reckless kid who started all. No, it’s not fun. Then, after a day or two, it started to crawl back on me. That scene. The duel between Kochiyama and Kaneko. They were determined to have it. Kochiyama, a local gambler and a bookie, and Kaneko, a Yojimbo for the local gang leader, were destined to have it. But when they are on the verge of bursting into action, for the reason nobody knows, Onami (Setsuko Hara, only 15 years old) shows up. The (anti)climax of this duel is the best of all cinematic duels. After a week, every frame of this film haunts back, like a kaleidoscope of the lost world. It had a strange effect on me. Though knowing the ending is so pessimistic, tragic, I want to revisit the world of Kaneko and Kouchiyama. “Kouchiyama Soshun (1936)” is one of only three surviving films of Sadao Yamanaka. The other two are “The Million Ryo Pot (1935)” and “Humanity and Paper Balloons (1937)“. 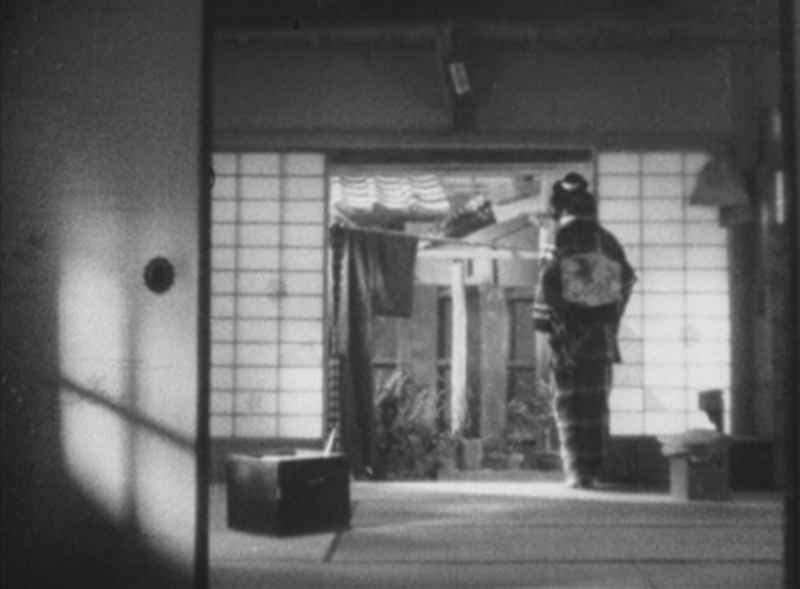 If there is a genius in the world of filmmaking, Sadao Yamanaka is the one. He had directed more than twenty films and scripted many more screenplays before his untimely death at the age of 28. His directorial debut was “Dakine no Nagadosu (1932)“, considered to be his finest work. This film is also considered lost, but the rumor of the surviving print floats around. Even though “Kouchiyama Soushun” is not considered his best of the surviving three features, still you can feel the power of his storytelling. Sometimes filled with cinematic energy and liveliness, sometimes infused with understatement of the unbearable sorrow and longing, its narrative is carefully crafted but boldly painted. Take, for example, the demise of Onami. There is no glimpse of her after one of the gang found her in the hiding. Only we see that Kouchiyama and Kaneko fight to their death to save time so that the kid brother can take her back . Because we do not see Onami again, the succeeding narratives made her a sort of metaphysical presence. As in “La Strada (1954)“, absence invokes such a power. But Yamanaka takes it further. The absence of Onami was projected on these two men, then reflected back on us. But, forget analysis. You will feel it. A feel of fake snows. A feel of a slap on your cheek. A feel of dizziness. A feel of redemption. That’s all we need.